New Year's Eve costumes are a great excuse to dress up again. Not quite Halloween, but you can be creative with a festive New Year's hat, or create a theme party and invite your guests to dress in costume. Ready! Aim! Shoot!! Vanish. This white top hat with attached white rose is accented with a frilly brim, intricate stitching patters throughout, and gold bordering. Feathers and pearl-like beads add even more style to its sturdy build. Two attached hair clips to keep it in place. This black top hat with attached black rose is accented with a frilly brim, intricate stitching patters throughout, and gold bordering. Several feathers, including one peacock feather and pearl-like beads on the rose add even more style to its sturdy build. Two attached hair clips will keep it in place. This gray top hat with attached gray rose is accented with a frilly brim, intricate stitching patters throughout, and silver bordering. Feathers and white pearl-like beads add even more style to its sturdy build. Two attached hair clips to keep it in place. This black mini tricorn hat is accented with a frilly brim, wild feathers, intricate stitching patters, ribbons, and silver bordering. Two attached hair clips to keep it in place. This Venetian half mask comes in fuzzy black with intricate gold accents and bordering. For an easy and comfortable fit, it rests on the face like glasses frames. This black cat style half mask comes in fuzzy black with a variety of intricate black patterns and bordering throughout the face and ears. For an easy and comfortable fit, it rests on the face like glasses frames. This masquerade half mask sits on the face easily and comfortably like a pair of glasses. It has a complex, black pattern with intricate gold bordering around the mask and eye holes. 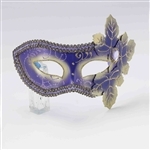 This purple Venetian style face mask is accented with glittery patterns, and a black and gold sparkling border as well as attached leave shaped cutouts. The entire mask is a sturdy, metal construction. It is affixed to the face by the tying of two purple ribbons attached to the mask. Where did he go? Great costume accessory!